Need to write a letter and need some guidance? Looking for ideas on how to write your company policies? 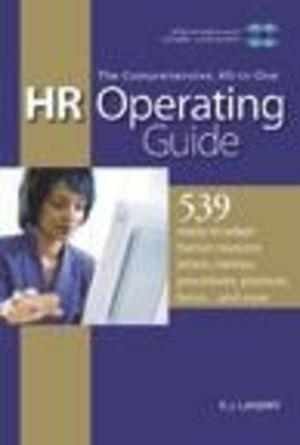 The Comprehensive, All-in-One HR Operating Guide provides a diverse and wide-range of human resource information, including business memos, strategic planning techniques, development programs, processes, administrative guidelines and forms.The topics include strategic planning, employment, compensation, benefits, employee services, employee relations, labor relations, organizational development and planning, safety/security issues, general administration and international issues. The 539 ready to adapt documents are transferable across industry segments, as all companies are dealing with the same universal elements - people and organizational issues. "The information is detailed and comprehensive, action-oriented and covers a broad spectrum of human resources issues and topics that almost every company faces on daily. This user friendly package is suitable for entry level, senior level human resource professionals and line management alike. The material is clear and easy to follow. The package consists of two CD-ROMs and a written guide. The written material provided in the book portion of the package serves as a user's manual."